It’s Evolution addressbook components showing contacts from a CouchDB database. As stated in previous posts, all contacts in that database would be automatically replicated to a remote CouchDB instance, so, for instance, you could just see and edit/delete/whatever them from a web interface, and the changes would show up in Evolution. Code is in GNOME git, under couchdb-glib and evolution-couchdb modules. As the first step on CouchDB desktop integration, here’s version 0.1 of couchdb-glib, a GLib-based API to talk to CouchDB. This initial version only allows reading and does all operations synchronously (not a problem in most cases, since the communication is done to the local CouchDB instance, which is quite quick, at least from what my tests show so far). Next releases will have all the missing functionality. And, well, no screenshots to show, so here’s some example code for you to enjoy. Source code is in GNOME GIT, under couchdb-glib module. In the last UDS, there were some talks about UbuntuOne, the technologies it uses, and how it could be well integrated into the Desktop. Also, there were discussions about how it could be integrated painlessly into upstream projects. So, here’s an idea on how this could be done. First, it must be said that the easiest (and quickest) way of achieving UbuntuOne integration in Ubuntu would be to just patch/extend applications so that they supported accessing the UbuntuOne server, and have Ubuntu packages use that as default for users with UbuntuOne accounts. That would make most Ubuntu users happy, but it would not benefit at all users of other distributions, and worst, the upstream projects. Now, if we look at the technologies being used in UbuntuOne, there is one awesome thing, called CouchDB, a project supported by the Apache Foundation, which provides databases (of JSON documents) that can be replicated (and 2-way synchonized) to other hosts. So, what if we had Linux Desktop applications use this for storage of files and settings? Well, what would happen is that we’d gain data / settings replication and synchronization for free. And also, if we could come up with standard formats / locations for common information (accounts, notes, mails, calendars, etc, etc), we’d also gain a shared storage for all applications to use, solving the problem of incompatible formats / locations used by similar free software applications. CouchDB knows already how to deal with conflicts, as this is included in the automatic replication / syncing features it provides. While normal documents in CouchDB are JSON, you can attach any kind of file to any JSON document (even to empty JSON documents), so any kind of files can be stored. Also, it allows users to create as many databases as needed, so storage for different needs can be easily separated. CouchDB provides a sort of revision history, so it could be used for nice stuff like Zeitgeist. This, not being an Ubuntu-only solution, could benefit every Linux Desktop user. UbuntuOne would be a service built on top of this that users can subscribe to. 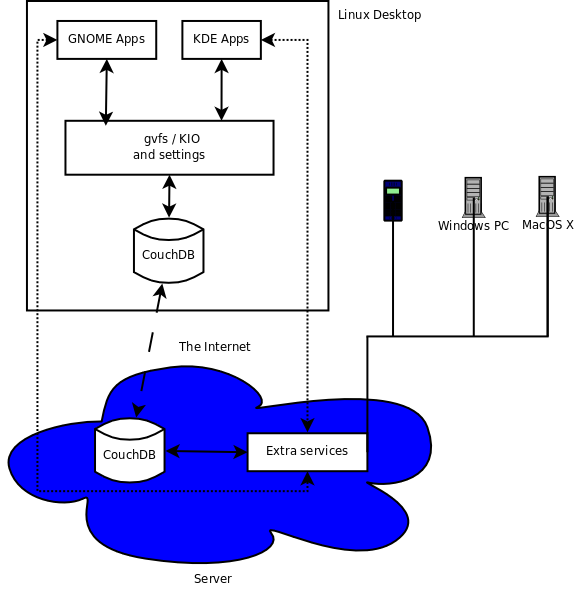 But others could just setup a CouchDB server on their home / company network and use that by just pointing their local CouchDB to their remote CouchDB replication server. To continue my investigations/playing on this, I’m going to try writing a gvfs backend to manage files in the CouchDB instances. Once that’s done, applications could start just writing their files to couchdb://… URIs instead of file://… ones and enter the replication/synchronization world with just a single change. Next, a GConf/d-conf backend could be added for replicating/sync’ing settings, and so on. Last week it was hacking week for the openSUSE-GNOME team, so I continued working on a little project I started a few weeks ago, which is, in the good old Richard Hughes tradition, a thing called AdminKit, which is a PolicyKit-based framework for allowing user applications to run administration tasks. Add more admin operations, as needed. For openSUSE, we have quite a lot of functionality via yast’s command line interface, and other distros have similar stuff, so anything we need can be added AFAIK. And, soon, packages at my home build service repository. Today’s release day for openSUSE 11.0, the best openSUSE distribution ever… yeah, that’s true for all new distributions, ok. But it is the release I feel more proud of, since it’s seen a lot of GNOME-related work, as Vincent explains in this interview. And this work will continue in the soon-to-come 11.1. First of all, I don’t think GNOME is in decadence at all. The development platform does nothing but improve (GTK/glib, new gio/gvfs, libgnome/bonobo/etc disappearing, good bindings for lots of languages, etc), and applications do the same. We offer incremental updates on each release, a lot of work is done, but it’s true that for some end users, they might not see changes big enough to consider it a new version. So maybe, apart from the time-based releases (which work pretty well, IMO), we should maybe try to have, apart from the individual modules’ roadmaps, some sort of desktop-wide features to accompany each release. If we set, for instance, a “all apps will use gio and support working with remote files” goal, I think that would make a better release feature that end users will better appreciate. Similar desktop-wide goals could be used for each release, which will change, IMO, the user’s impression of the new releases. I hear some people considering 3.0 should contain a lot of development platform changes. And well, while changes in the development platform are great (that’s why it’s improving all the time), I don’t think the future of GNOME (the desktop) releases should be so tied to the platform. On the contrary, the platform should adapt to the applications being written. Some years ago we did a lots of improvements to the platform because we were writing big apps (Nautilus and Evolution). Since I started using GPSs, I ended up visiting forums and mailing lists about the subject, finding that most people use illegal software (cracked programs downloaded from P2P networks) and maps (ditto, got from P2P), so if we could offer a free software-based solution for these people, they would probably move on. This is of course just one example, which is even being already covered by OpenStreetMap, but I’m sure there are lots of similar markets out there that we could try to cover better to bring 1000s of new users to our desktop. As for innovation, this is probably something we need to improve. There is innovation for sure (Gimmie, Pulseaudio integration, Compiz Fusion (not really a GNOME thing, but it’s got GTK-based tools that nicely integrate into GNOME), Banshee 1.0 (try it, it’s great! ), Clutter, etc), but it’s true it’s not easy to make revolutionary changes (like using gimmie instead of our current panel, for instance), since it means convincing a lot of people in endless discussions. I think part of the problem is that people working on similar stuff are not put together to come to decisions (like distros working on similar solutions for the same thing ), so we probably need improvement there, like having the hack meetings that were discussed recently. Last weekend I’ve been in Valencia for the II GUADEMY, organized by PoLinux (the Linux Users Group of the Universidad Politécnica, where the event took place). We are sharing some stuff now, much more than a few years ago (HAL, DBus, PackageKit, WebKit, poppler, fd.o specs, etc), but we still have a lot of duplication (duplicated screensaver / power management / login manager / etc cores, with lots of security and other issues). People generally agree in sharing code, but sometimes in the form of “here’s our implementation, based on our technologies, use it if you want”, which doesn’t work. There were complains about how GIO was written without taking KDE’s KIO people into account, and about KDevelop new code, which didn’t take into account Anjuta’s people. So, we need to fix this. We need a process to determine what to share, as Will said in our talk, and, from what I got from Vincent‘s talk, Freedesktop.org is in need of an official board that can establish a formal process for accepting standards and implementations, and also it needs to get more KDE people involved so that it’s not seen as a GNOME-only thing. It seems to me the natural way would be to fix fd.o’s situation and use it for further sharing. The whole Saturday morning was dedicated to talk about the GUI toolkits’ future, with Carlos Garnacho, Holger Freyther and Javier Fernández from igalia. It was really interesting to see what the future might bring us, since free GUI toolkits need not only to cope with better look&feels, but also with different devices, given the mobile device market is making a lot of use of our technologies. Some further examples of things that could be shared: an indexing/metadata system, PIM data access and management. I missed Sunday’s talks, since my bus was leaving at 11AM, but I’ve heard there were some joint conclusions in the last session, so let’s see if someone that attended publishes them. Vincent didn’t want to believe me, but really, normal Spaniards don’t usually go to places like Los Bestias (details from Jos). I wouldn’t really recommend it to anyone, except for stag parties (if you ever go to this kind of parties), but it was fun to see something different, we laughed a lot during the dinner. Fortunately, we arrived a bit late, so we just had to listen to the Karaoke for a few minutes, after that, it was shut down. Just wanted to end up with a big congratulation to the organizers, they managed to do a great conference, with core international speakers, even though the planning started quite late. Now looking forward to GUADEMY III, which might perfectly take place, why not, in the joint GUADEC/Akademy in 2009. You can see the slides of my talk here. These don’t include Will’s plan for code sharing process, which I guess he’ll publish soon. For the first time, I am mentoring a student for this year’s Google Summer of Code, who will be working on a GNOME client for the openSUSE build service. Mario (ie, the student) seems to be a very motivated person, so I’m willing to see the results of his work this summer, and to have another future contributor to openSUSE and GNOME. As for the mentoring itself, following Federico’s mentoring HOWTO should make things easier for me, so I hope to do a good job. More news about the project as things progress.